The first Sunday after Labor Day is usually designated God’s Work, Our Hands Sunday (a day of service) by the ELCA. 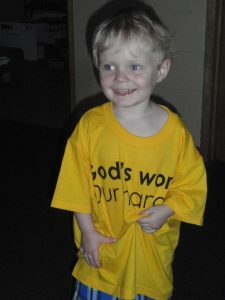 Lutherans nationwide are encouraged to wear their GWOH T-shirts to church and then join in a volunteer activity. These activities have included filling school bags for Lutheran World Relief, visiting seniors at Heritage, setting up beds at The Road Home, and working in the garden at Winnequah School. This is a great way to get involved, get to know people in and around St. Stephen’s and help out! God’s Work, Our Hands Sunday is September 9, 2018. Watch for more information about service opportunities coming this spring. 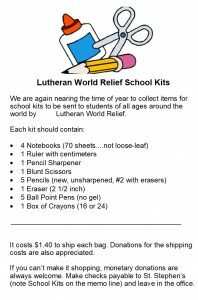 We are currently collecting items for the School Kits for Lutheran World Relief. School bags and directions are on a table in the narthex. Donations are due August 26th. The list of supplies needed for each bag is below.